Stella and Wyn grinned as they watched The Doctor dancing around the console and singing along with what they both thought was a pretty mundane pop song. “Your mum used to sing that song all the time,” The Doctor answered. “In my lab at UNIT HQ. It was a new song back then, when I was exiled to Earth and she came to work as my assistant.” He smiled nostalgically. Wyn and Stella looked at him and laughed, though not unkindly. “Sounds cool. Unless its all a load of old Shakespeare,” Stella commented. The two sisters recognized the signs of The Doctor going off on a tangent and just waited for him to finish. “Brown is the new black,” he said nonchalantly and hummed a few more bars of that song that he alone seemed to remember from the early 1970s as he programmed their landing in the hanger bay of the Pluto Arts and Culture Centre. “Strange building,” Stella commented as they made their way from the hanger bay where the TARDIS had puzzled the squat little man with an orange face and a hump who took the berthing fees. He hadn’t been able to make up his mind whether it should be classed as a craft or as freight. They travelled on an electric tram car from the utilitarian hanger bay through a well-lit tunnel with a glass roof that looked out at the Plutonian sky beyond the protected habitat with its artificial atmosphere. Strange building was fair comment. It was also a very beautiful building. It was a huge hexagon made of opaque crystalline substance that had its own internal luminance. The whole place was bathed in diffused white light. It was as if a cloud had been shaped and set in a mould to construct the walls and high ceiling. “Yep. The restaurant is this way.” The Doctor steered them towards the source of the usual sort of sounds people make when eating and drinking publicly. The usual sounds, but not the usual people. At least not as Stella understood the term. Intergalactic also meant inter species. “Don’t stare,” Wyn told her as they took in the different definitions of ‘people’. It had been a while since she had been in such mixed company herself and it was hard not to seem rude, but Stella was totally overcome. “What about that lot?” Stella continued as they gave their breakfast orders to the waiter and she tried to look casually around. The focus of her attention now was on a group of tall humanoids with flowing red hair down to their waists, male and female alike. They were all dressed in leather and chain mail and spiked helmets. The Doctor looked puzzled at first as he took in the clothing. “All day opera?” Stella wrinkled her nose at the thought. The Doctor smiled and said they had operas where he came from that lasted as much as fifty-two hours – two Gallifreyan days. They were very rarely performed all at one sitting, though. Usually over five or six nights. “There’s a list of events over there,” The Doctor told her, waving towards a large screen set in the opaque white walls. It was like a very hi-tech version of the touch-screen information panels at bus stations. 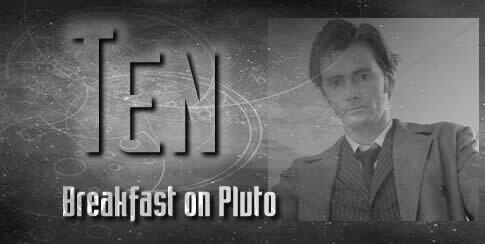 Wyn ate her Plutonian breakfast omelette and drank some Plutonian coffee before wandering over to have a look. The Priminian Ne-Jio-Ri-Har-Ring-Um was the main attraction in one of the five theatres of the Hexagon. In another, the Oriaian National Dance Corps were performing an aerial ballet. Golden people with huge golden wings dancing in the air. She could go for that. She thought Stella would enjoy it, too. She would probably prefer it to The Plutonian Macbeth, anyway. “Excuse me, are you done with the screen?” asked a soft male voice. Wyn turned and looked at a pair of piercing blue eyes. The face that went with the eyes was good looking. Blonde-brown hair and a square jawed hero look that would have made him a good candidate for the next James Bond back on Earth in her era. She wasn’t straight. The only man in her life apart from her dad and her brothers was The Doctor, and her affection for him was indefinable in the simple labels people put on relationships. Normally a man like this would do nothing for her. Yet, for some reason, she found her mouth turning up at the corners to smile at him, and when he smiled in return she was thrilled. “No, I only just got here,” she answered. She wondered later why she said ‘I’ and not we. But something in her wanted to pretend she wasn’t with her sister and The Doctor. She was hoping…. “I’d love to,” she answered, and when Jamie offered her his arm she smiled broadly and didn’t even look back at The Doctor and Stella still sat at the table. “Scored? Muffin?” The Doctor pretended he didn’t understand the terms. He did, perfectly well. The Doctor didn’t answer this time. He was thinking. It was the sort of thought even his mind needed to take time over. Relationships! Living a thousand years didn’t make him any better qualified than a human in that field. But two things struck him. First – Wyn’s smile as she walked away was the brightest he had ever seen her smile. Second – She WASN’T into men. So what DID that guy have to make her smile like somebody who has just discovered the meaning of love at first sight? Stella smiled. The Doctor was going to take her to the theatre. It was practically a DATE. She enjoyed herself. She didn’t expect to. Most of the ‘performing arts’ on display were ‘highbrow’ stuff like opera, ballet, modern space age versions of Shakespeare, poetry readings and more, that a teenager whose regular reading matter was Smash Hits and Seventeen wasn’t really meant to enjoy. She had been fully prepared to be bored by it. She wasn’t. She actually enjoyed it, especially the ballet. She noticed that they took seats quite far away from Wyn and her new friend, but not so far that The Doctor couldn’t keep an eye on them. And when, in the interval he asked her if she would like an orange juice, she wasn’t surprised to see that Wyn’s friend had gone to the vending machine, too, while Wyn stayed in her seat. The Doctor stood behind the man and studied him carefully. He tried to read his mind, but found it was blocked. This was a man skilled at putting up mental walls. He didn’t seem to BE telepathic himself. That meant he had been TRAINED to resist telepathic invasion of his thoughts. Well, The Doctor thought. Lots of people were in these days when criminals could get hold of mind reading devices and obtain privileged information. He might work in a bank and have to hide the combination to the vaults behind a psychic wall. Or he might BE a criminal, hiding his own real intentions. There was something else. Standing this close to him The Doctor was aware of it very strongly. He understood now why Wyn had been attracted to him. Jamie Garr Jass didn’t say anything. He looked at the controlled ire in The Doctor’s eyes and knew there was nothing he COULD say. He turned and went back to his seat with the drinks he had obtained for himself and Wyn. The Doctor slid credit discs into the machine and picked up the carton of orange juice it dispensed. He took it back to Stella and settled down as the lights went down for the second act. But he kept an even closer eye on the stranger with enough personal attraction to persuade Wyn to go against her nature. At lunchtime, The Doctor and Stella found the restaurant again. Wyn and Jamie were already there, sitting at a table, talking and laughing together. Stella looked at them and huffed in outrage at the sheer blatancy of it. If even Stella was thinking about that question, then it was time to GET an answer, The Doctor decided. “Interlope?” Stella giggled at The Doctor’s use of a word she understood the meaning of but had never used in her spoken vocabulary. “Oh, shut up!” Stella answered with a laugh. They were still laughing as they moved around and sat down at the two empty seats either side of the table, interloping completely. “So, when’s the wedding?” The Doctor asked unashamedly. The Doctor glanced at Wyn again and seemed on the point of saying something, then changed his mind. 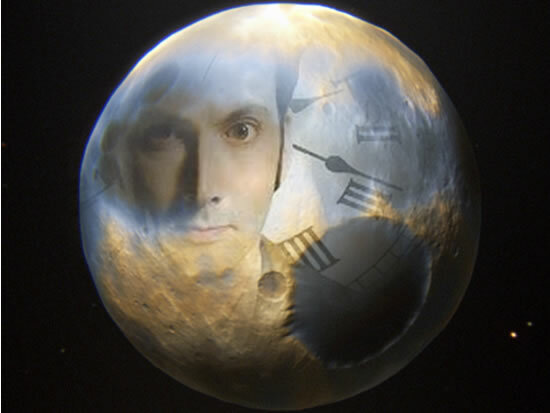 That he was a Time Lord was NOT a secret, especially. Nor the fact that he was the last. The destruction of his planet was legendary. There were poems written about it. There was an opera nearly as long as one of the Priminian epics about the Time War, with the fall of Gallifrey as the dramatic finale. But his world had enemies other than the Daleks, and he had many more personal enemies. On the whole he preferred to CHOOSE who he revealed his identity to. He wasn’t exactly annoyed at Wyn, just a bit irritated by the whole situation. “I’m just nipping to the loo,” Wyn said when they were drinking coffee after lunch and Jamie had been talking about the afternoon’s programme of performing arts, suggesting that they watch together. Stella said she’d go with her. The Doctor grinned and joked to them about how Human women always went to the toilet in pairs. When the two were out of earshot, though, and he turned back to the table his grin faded very quickly, and even more quickly his hand reached out and clamped down on Jamie’s arm. Jamie looked at The Doctor and found himself unable to turn away from his eyes. They burned into his soul while giving nothing away of The Doctor’s own soul. Jamie shuddered as he tried to break eye contact. The Doctor relented and he sighed with relief. Again, Jamie felt he had no choice in the matter. He sighed and leaned close to The Doctor, speaking quietly so that he would not be overheard. “Well, it’s lucky I’m here,” The Doctor told him. “But before we go any further, you explain things to Wyn.” He looked around as the two sisters returned from the bathroom. He waited until they had sat down again. “Jamie has some things to tell you,” he said and looked pointedly at him. “Yes,” The Doctor felt himself understanding those motives fully. It was the reason he had companions in the TARDIS after all. Because the wonders of the universe were all the more wonderful for seeing them with somebody else. But he was still not convinced. Jamie sighed again. He looked at Wyn pleadingly. Wyn looked at The Doctor and Stella. Neither were giving her any helpful signals about whether she SHOULD believe him. She WANTED to do so, though. “What does The Doctor mean by ‘secret weapon’?” she asked. Again Jamie was uncomfortable. The Doctor’s expression towards him was clear. Nothing less than total truth would do. There was no obvious physical or visual sign. But Wyn looked at Jamie after a minute or two and shook her head. She looked sad about that. So did Jamie. The Doctor looked around the restaurant. It wasn’t too busy now. They were almost the last customers still lingering at the table. Most people had already headed away to get the best seats for the afternoon performances. Jamie nodded and reached out his hand to Wyn. She looked at him and gasped as he shimmered before her eyes and transformed into a woman of about forty, still attractive, with long brown-blonde hair and the same bright blue eyes. She was wearing the same casual suit that Jamie had worn, but the shirt buttons strained as female contours filled it. She shimmered and became male again. “Really?” Stella interrupted. “You mean even on other planets people are….” But The Doctor laid a hand on her arm and quietened her. This was between Jamie and Wyn. Jamie looked as if he didn’t like it very much. But again he also looked like he didn’t have much choice about it. That was a put down. “Professional”. Jamie was on the verge of protesting but The Doctor was on the move. He walked fast, purposefully, but at the same time managed to look like he WASN’T in a hurry to get somewhere, wasn’t urgent in any way. The effect was ruined by the three of them having to gallop after him. Inside the TARDIS, Jamie reverted to female again, explaining that it WAS her usual look. Gendermorphs could be male or female at will, but often they chose a preferred ‘default’. “And AS a female you prefer women, still?” Wyn asked. Wyn looked at Jamie. She reached out her hand to her and it was clasped gratefully. Their eyes met and something unspoken, something beyond even telepathy, passed between them. The next moment they were embracing each other and Wyn gave a soft sigh as Jamie turned her head and kissed her. A half hour later when they returned, the two were STILL engrossed in a passionate clinch. This time The Doctor DID have something to say about it. The Doctor held up the two slimline gadgets. Wyn beamed happily as she reached out to take the one that looked like a fine gold pen. It even had her NAME on it, she noticed. Stella took the other one and pulled the top off it to reveal a very small blue light. “I would have thought the TARDIS could scan the whole lot,” Wyn pointed out as they made their way back to the Hexagon. Jamie looked at The Doctor and seemed about to point out that SHE was the Time Agent around here and The Doctor just a freelancer. Then she thought again. There was something about The Doctor. He LOOKED like an impoverished mature student who didn’t know how to use a steam iron, but beyond that mere physical appearance was an overriding authority. In any situation The Doctor was in charge. They both laughed and Jamie transformed again. They held hands as they went on their way towards Theatre One, where they managed to sit through a full act of the Priminian opera while scanning the rest of the audience. Over on the other side of the Hexagon The Doctor and Stella watched part of the Plutonian Macbeth and a very fine contemporary dance from the seven foot tall, stick thin and ethereal troupe from Aleria V. K9 wandered unmolested through the arena where the massed choir of Galena IX, three thousand individual voices, were making beautiful harmonies that were lost on a robot dog who had never been equipped with an ear for music. “Are you sure this thing is working?” Stella complained as she waved her sonic eyeliner with a satisfying ‘swish and flick’ that in a more peculiar universe than this one might have summoned demons. She had tried it on about three hundred people watching a ‘dance’ performed by a species who were best described as coloured smoke inside a thin, flexible and see-through skin. Every one of them came up negative for time travel residue. “What do we do when we FIND who we’re after?” she asked. “What IS a Grandfather Paradox anyway?” Stella asked. “Doctor?” Stella turned around, wondering why he had stopped talking in mid-sentence. “Doctor?” She turned around and around, searching for him, thinking he had just dashed off into the crowd on a whim. She couldn’t see him. Nor could her sonic eyeliner. Before, it had managed to register the two of them as vortex veterans. But now it just showed her. The Doctor had left the building! She was just about hysterical by the time Wyn and Jamie and K9 reached her. Wyn comforted her as best she could, but her own heart felt like lead as she tried to work out what had happened. Stella showed him. Jamie tapped the very small keys on his wristlet and then held his arm up high as he read off the data on the screen. “There was some sort of transmat beam involved. He was grabbed by it. It MUST be local, because the Hexagon is shielded against external transmats. She turned and ran before either could ask how she planned to ‘get’ the TARDIS. She was out of breath by the time she reached the station and saw the tram pulling away. She was not, by any stretch of the imagination, an athletic person. She wasn’t the fat kid of seventeen any more who almost never left her bedroom. She walked regularly in the hills around her home and spent at least a couple of hours a week practicing the martial arts The Doctor taught her years ago. But she was STILL a short, size 14 woman in her thirties, and wearing an pencil skirt, to boot. Nobody expected her to jump for the back of the moving tram. If she had thought about it she wouldn’t have expected it of herself. But she wasn’t thinking about herself. She was thinking about The Doctor, and how much danger he might be in. So she jumped and scrambled aboard. She jumped off again before it stopped at the other end and raced past the hump-backed toll-keeper, reaching for the TARDIS key around her neck as she found the aisle where it was parked. She and Stella had always teased The Doctor about talking to the TARDIS as if it were sentient. But this time she put her hands on the console gently and spoke to it in a low voice, pleading desperately. The Time Rotor glowed a brighter green for a long moment. It had replied to her. She reached for the flight controls. She didn’t intend to dematerialise. That WOULD need The Doctor at the controls. In any case, the same shields that prevented transmats from getting through the Hexagon walls would prevent the TARDIS from getting in that way. But she knew the TARDIS could move in a more conventional way. She hesitated for a moment, working out how to do it, and was surprised when a button lit up in front of her. She pressed it and felt the TARDIS engines kick in and a forward momentum. Other levers were illuminated just in the nick of time. On the viewscreen she saw the hunchbacked man running away as the TARDIS pursued him erratically. It was a bit like a computer simulation, with left and right and forward and up. She pressed up gently and felt only a slight bump as the TARDIS clipped the top of the tollbooth where the poor man had hidden. She missed the top of the tram, too, as she rose over it and got in front, racing it along the track back to the Hexagon. She aimed for the plate glass entrance doors and hoped the sensor would trip and they would automatically open before the TARDIS smashed through them. They DID open and she flew through, skimming a foot off the luxuriously carpeted foyer and into the corridor that led her back to Jamie and Stella. People were screaming and scattering and she figured that security would be along soon, but she thought only of getting back to them. Her landing was a little bumpy, but it was right where she wanted it to be. Right on the spot where Jamie had taken the energy reading. The TARDIS engines went quiet as she let go of the controls and reached to open the door. Jamie and Stella ran inside and she closed it again. Security could scream and shout and hammer at the door, but they had other things to do. Wyn nearly jumped out of her skin as she heard The Doctor’s voice through the speaker on the console. He sounded echoing and far away and at the same time very close. “Is it dangerous?” Wyn asked, looking at Jamie. The Doctor’s voice gave instructions and Jamie followed them exactly. He seemed to be getting weaker and fainter as they worked, though. “I don’t know,” he answered. “Maybe an hour at the most. Sooner or later my molecules will just scatter too far to be retrieved. Stella looked at her watch. It had been nearly that, now. She disappeared. Wyn kept on counting steadily until ten and flipped the switch again. Jamie appeared. She was still holding the watch, but it was closed. It was glowing with a golden light. Wyn thought she could hear The Doctor’s voice coming from it in a hoarse whisper. It wasn’t something she heard with her ears, but with her heart. She KNEW that he was in there. Jamie blinked and looked at the fob watch in her hand. “Open the watch,” Wyn cried. Jamie held it at arms length and flipped it open. The Doctor’s voice escaped from it. The same whisper she thought she had heard before, but now the whisper filled the console room, and so did the golden light. They were all bathed in it. Wyn and Stella both gasped out loud as they, too, felt The Doctor’s very being, his fantastic, incredible soul, enfolding them briefly before the light began to coalesce in a pillar of golden light that slowly took on the shape of a man, and ever more slowly The Doctor’s features began to form. The light faded to a pale yellow aura around him as he stood there, smiling. Wyn stepped towards him, then stopped, uncertain. Wyn reached him first. Then Stella. He hugged them both, and grinned at Jamie as she held back. “Is it catching?” Wyn asked. Now he was back, safe and sound she was glad to make a joke. “Why would a woman kidnap you?” Stella asked as The Doctor moved around to the drive controls and kick-started the engine. He was going to drive the TARDIS the way she had, earlier, all the way to the co-ordinate. Outside, security staff were shouting loudly as they chased after the TARDIS. The TARDIS was in the vanguard of a chase through the corridors of the Hexagon and down the stairwell to the basement, where the walls were not opaque and shining, but rather a dull pale green. “Hold on tight,” The Doctor called out as they rapidly approached a locked and bolted double door. He pushed the forward lever hard and the TARDIS smashed straight through the door. It was a practice studio for the performers upstairs, a wide room with mirrors along one wall. In the centre of it was a portable static transmat receiver around which four hooded figures were gathered. They turned and stared as the TARDIS crashed through the door. One of them had the presence of mind to pull a gun and fire but the bullets didn’t even scratch the paintwork. Meanwhile the security staff were pouring into the room, their own weapons drawn. “Now is a good time to produce that psychic paper,” The Doctor said to Jamie as he got ready to step out of the TARDIS. Not that it was needed. Again, The Doctor’s mere physical presence was enough. The security guards disarmed the four men, but were happy to stand off as The Doctor approached and pulled back the hood on one of them. “I serve The Master,” the man answered. “The greatest Lord of Time, The Master,” the man repeated. He reached out his hand and touched the mind of the Master’s adherent, reading the memories that were at the forefront of his mind. He saw something there that almost froze his hearts. This man and his fellow hood-wearers - had been there when The Master had been executed on Skaro - prurient witnesses to the sad, shocking event and recipients of a souvenir that ought to have been atomised with him. He looked at the transmat receiver and asked Jamie to search it for anything that didn’t belong to the machine. “Doctor!” She held something in the palm of her hand. The Doctor looked and then recoiled from it as if it was contaminated. “It’s just a ring?” Jamie looked at The Doctor in surprise. “In the receiver mechanism,” Jamie replied. “It looked as if it had been ‘wired up’ as part of the process. He would not touch the ring. The evil at the black heart of The Master’s soul tainted it. The pure evil. Any good that might once have been in him, any chance of redemption, was atomised. Only the evil lived on, carried by fools such as these who saw glamour in the worship of his darkness the way some people were attracted to the idea of vampirism or satanic crafts. Jamie did as he said. The Doctor stepped towards the transmat machine, programmed in a co-ordinate then switched it on. There was a glow within the mechanism and the ring disappeared. The Doctor took out his sonic screwdriver and aimed it at the machine. He turned to Wyn and Stella as they hovered by the door to the TARDIS, taking in all of the incredible story. Both knew of The Master as his legendary arch-nemesis and had seen only too easily the same awful vision of the future if this desperate plan had succeeded. They all three aimed at the transmat machine. It fizzed and sparked and then blew up with the sort of bang his old companion Ace would have been delighted with. The explosion was self-contained. Nobody was in any danger from it, but the security guards recoiled from it instinctively. One of the cultists saw his chance. The Doctor saw it in an eyeblink. The man turned and wrenched the gun from the guard who had detained him and swung around. He saw the muzzle flash and the bullet coming towards him. Then in the same instance he saw Jamie dive in front of him. “No!” he screamed and pulled her down. He hadn’t even attempted to slow time, but it all felt as if it WAS in slow motion. And then there was a frozen moment in which Wyn screamed out loud. “So is yours, Doctor,” she answered before Wyn rushed to embrace them both. Wyn looked disappointed at that. Jamie looked at her, then at The Doctor.